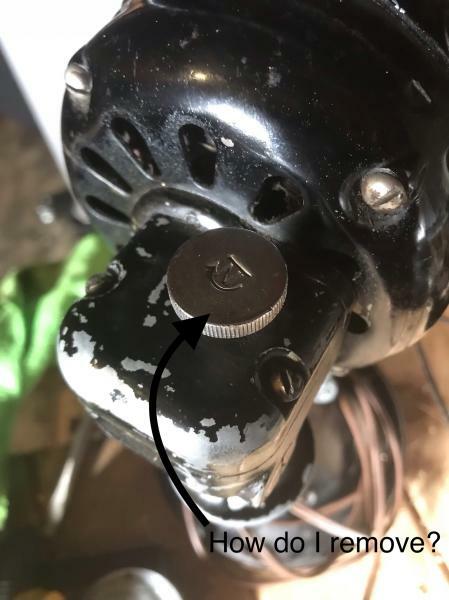 AFCA Forums > Antique Fan Collectors Association > Pre-1950 (Antique) > Vortalex Date of manufacture and oscillating screw removal...and best way to put felt on? You can’t remove those without force, they are pressed on. If you want to remove the top casing, remove screws and unscrew the knob to the left while holding the bottom wheel. To felt, clean the base well, and glue it to some felt a little large than it. Then you can trace it out to size, just enough to fold it over, and create little slits all along it to aid folding. I use spray adhesive, but superglue works, just messier and you have to be careful. Top picture is not a vortalex, the bottom two are.... how do I tell date on data plate? Three questions up top in the sub-header... Ryan answered two and three, for the first (date) use 1938... if your fan's label has a form designation (I can't make one out), that would confirm. Or disconfirm, but I'm confident with '38. Thanks Ryan and Steve! Great info.... no idea how you came up with 1938, but I’ll trust ya! I was told the rear oil/wick cup dates it as an early model....regardless, I love the look of the fan!Now I gotta figure out how to balance the blade! It runs perfectly smooth without blade in, with blade on it walks and bounces across the table! 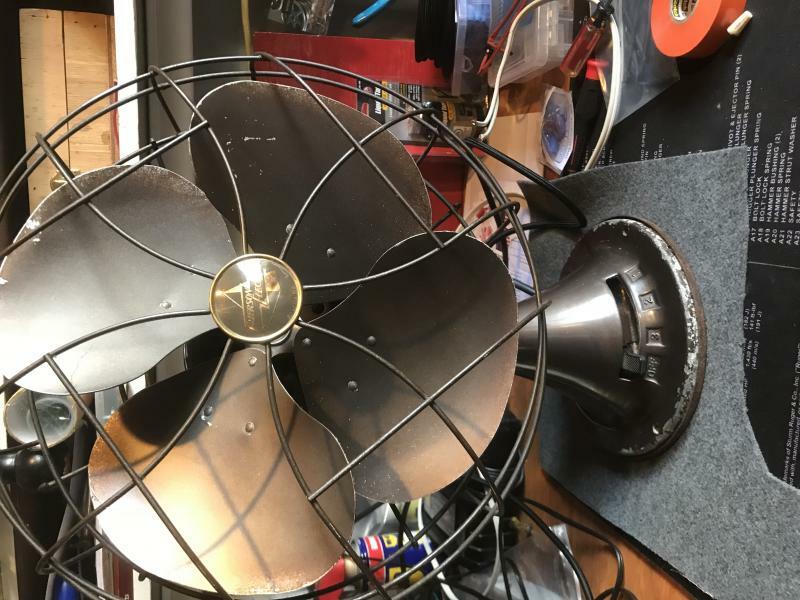 Another way to date the fan is the color of the fan's body and the color of the blades and the cage assembly. 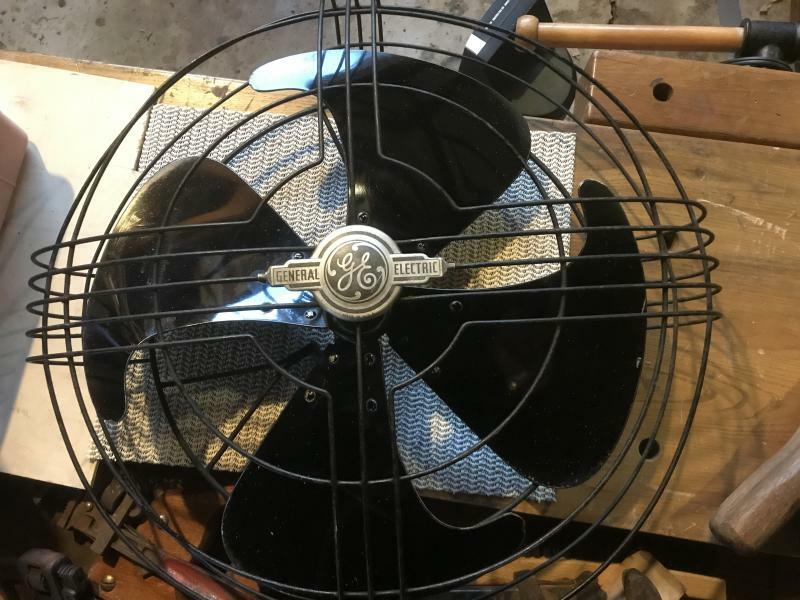 If the fan's body is black with polished aluminum blades and a cage with 5 horizontal wires and 3 vertical wires going through the middle of the cage the fan dates between 1938-1942, if the fan's body is a bronze color with tan colored blades and a cage with 3 horizontal wires and 3 vertical wires going through the center of the cage then the fan dates to about 1946-1949, if the fan's body is a light blue-green color (they called it seafoam blue) with a gunsight crosshairs style cage with a red GE badge with blades the same color as the body then the fan dates from 1950-1958, and if its a beige color body with a gunsight crosshairs style cage with a blue GE badge in the middle of the cage and blades the same color as the fan's body then the fan dates from about 1959-1963, which would of been the final variant of the GE Vortalex before it was discontinued in late 1963. 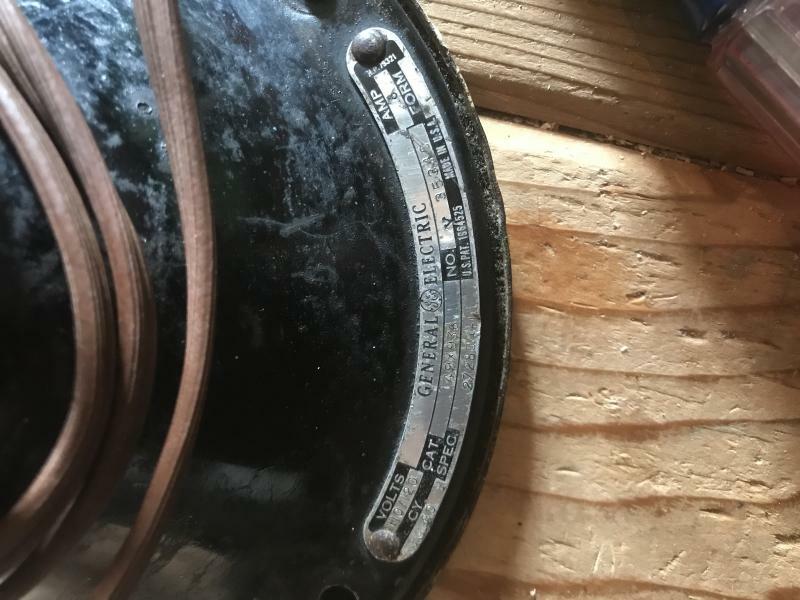 I would say that by the way the fan is colored (black body color) and the fact that the info tag has a form designation spot on the ID Tag but nothing stamped in it I think that the OP's Vortalex dates to around 1940 or 1941 as they did away with the form designation in 1939 or so. But because they would of been still using up excess stock of old ID Tags at that time yet the fan's ID tag has the Form Designation spot on it but because by that time they ceased using form designations on their fans they just left the Form designation spot blank on the ID Badge, and filled in the rest of the information as needed. Thanks Levi! Great information. I was excited when I saw the rear cup and it looks like original paint. It’s very glossy after cleaning and thoroughly buffing with microfiber cloth. I found some “natural” cleaning wipes that cut thru fanfunk with minimal effort and don’t harm paint/finish. The paint is not perfect, but I’m leaving original finish. The pic below is the cage and blade. The dating advice you sent about cage verticals/horizontal numbers is great. If I’m reading it right, then that puts my Vort at 1938-1942. Can you recommend a good way to balance blade or a video to watch? I’ve seen a few that range from a pencil taped to the motor and a setup that included lasers and a machine that doesn’t look cheap. I’m most concerned about not damaging the blade and learning the correct way to manipulate the blades. I’ve just used my hands to lightly touch up a few blades, but none have been this bad. Peter, you're gonna have a hard time balancing that Vortalex blade because the Vortalex blade is the hardest blade to balance out of all of the different blades out there because of how it's made. Plus because of the fact that the hub is cast aluminum it breaks very easily if stressed too much from bending it back and forth too much. You might want to have one of the more experienced members try and balance that blade for you. In the picture of your blade, it looks like the bottom blade is twisted in the ccw direction. Measure the distance between blades at precise points like the rivets and make sure they are equal. To bend it back, you can use the whack method, a 2x2 or 2x4 right in the direction it needs to go. 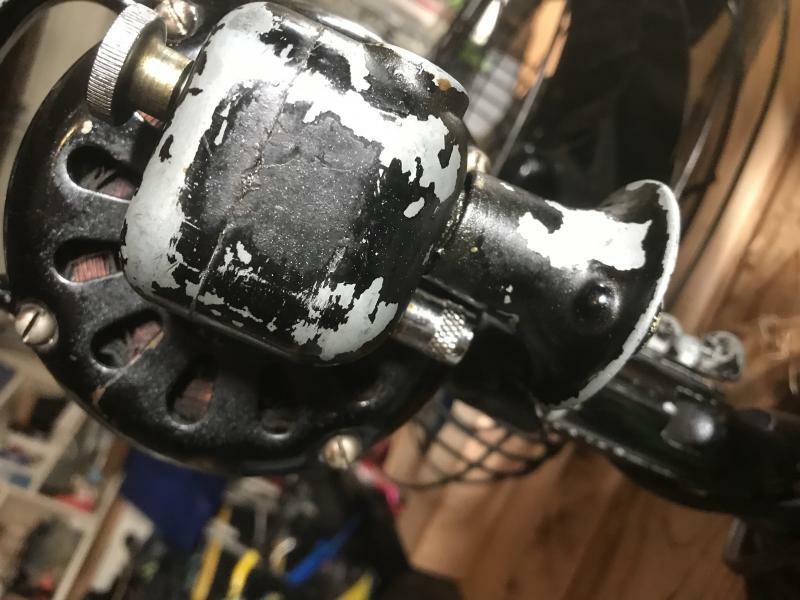 Ryan,I just left town again, but tried to remove gear housing on the Vortalex by removing oscillating control screw....i removed small set screw in centers, turned it left, and it got stuck after several revolutions..... I don’t want to break it. Am I doing something wrong or just need to man-up a bit and keep turning? Cheers and thanks for advice! Looks like a 1938 from the cat number and presuming the black blades are original. I believe the first run of the 16” first gen Vortalex started with black blades then quickly went to polished aluminum. That 5x3 cage looks great. I haven’t tried whacking these vorty blades into clock like I’ve done with the old brass blades. Not sure what you mean by set screws, but definitely remove the two flat heads on the top of the casing. Turning it ccw will remove it. Don’t force it though, it should be easy. Page processed in 0.1885 seconds (20% database + 80% PHP). 27 queries executed.